Check out Tobi's Outshine Me Satin Pants Get ready for the softest, sleekest pants imaginable. Reach for the Outshine Me Black Satin Pants next time you step out. 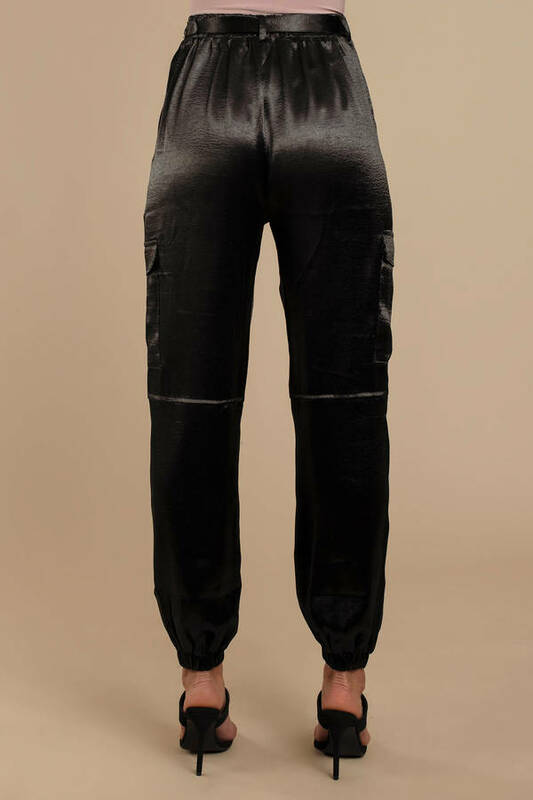 These satin trousers feature a high waisted construction, front waist tie, cinching at the ankles, and luxurious satin. Pair these satin joggers with a tight bodysuit and you're ready to go. Get ready for the softest, sleekest pants imaginable. Reach for the Outshine Me Black Satin Pants next time you step out. These satin trousers feature a high waisted construction, front waist tie, cinching at the ankles, and luxurious satin. Pair these satin joggers with a tight bodysuit and you're ready to go.